Adam regularly has spaces for private lessons. Private lessons, unlike Adam's workshops, are open to all styles of music. Adam teaches all ages, from complete beginners through to experienced players looking to expand their repertoire of techniques. All lessons are bespoke tailored to suit each students individual needs. ​"Adams lessons have brought my playing on leaps and bounds. His good natured, laid back attitude was just what I needed to give my playing a kick start. I cannot recommend him enough." ​Private weekly lessons priced at £15 per half hour. Skype lessons priced at £20 for 30 mins, £25 for 40 mins. Other lesson options are available. ​"I stumbled upon Adams website by coincidence, trying to find a teacher that knows about hot jazz and blues... It was impossible to find one in Germany at that time. Skype classes were completely new to me, but my scepticism was quickly gone when I realised how much fun it was to learn to play a new instrument, and how easy and natural it can actually be. Adam is not only a great guitar player but also a very encouraging teacher with an outstanding knowledge of this beautiful music from the past. A class with him is always something to look forward to. Adam holds regular guitar & ukulele workshops while on tour, at festivals and when at home in West Sussex too. Calling on four decades of playing and over 25 years teaching experience, Adam's workshops give students the necessary tools and techniques, essential to playing early blues styles. Adam regularly teaches at EuroBlues events. 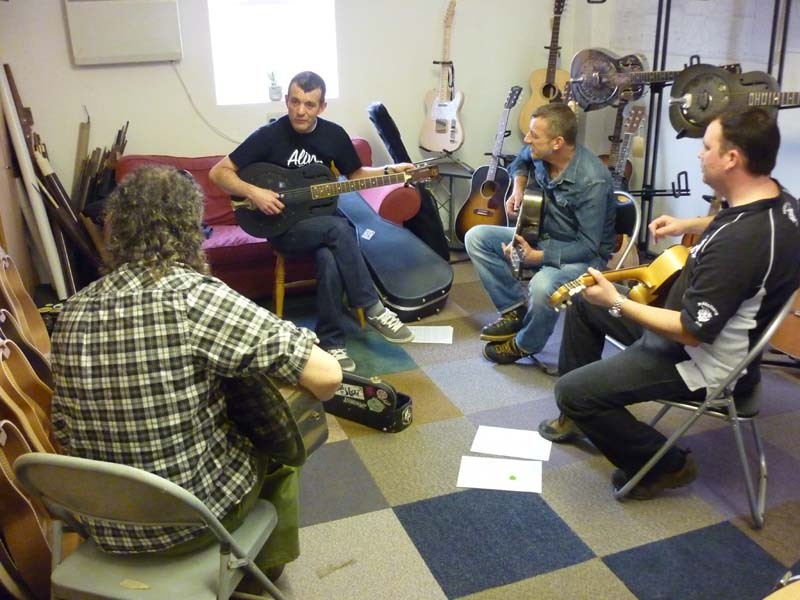 The EuroBlues organisation is a great resource for multi-instrumental blues related workshops in the UK. Click here to find out about the next EuroBlues event. Recent workshops have included; Fingerstyle Blues, Slide guitar, Ragtime, Blues & Hot Jazz Ukulele and most recently a series of workshops on the playing style of Robert Johnson, Tampa Red & Blind Boy Fuller. Sessions can be from one or two hours, up to whole day workshops, covering usable chord voicings & progressions, finger picking patterns and essential slide techniques. Chord charts & tab are provided. Adam teaching a slide guitar workshop at Dave King Acoustics. 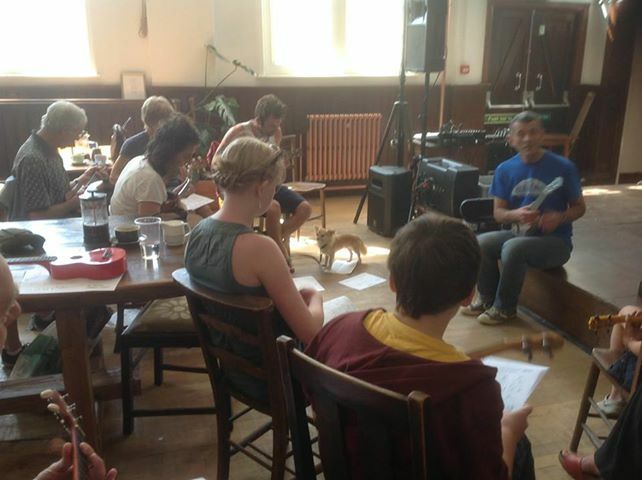 Adam teaching a uke workshop at the 2013 Fishguard Jazz & Blues Festival.